CareerBuilder.com faced challenges with their recent growth. 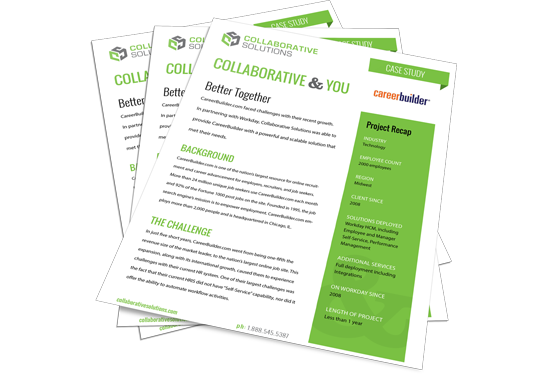 In partnering with Workday, Collaborative Solutions was able to provide CareerBuilder with a powerful and scalable solution that met their needs. CareerBuilder.com is one of the nation’s largest resource for online recruitment and career advancement for employers, recruiters, and job seekers. More than 24 million unique job seekers use CareerBuilder.com each month and 92% of the Fortune 1000 post jobs on the site. Founded in 1995, the job search engine’s mission is to empower employment. CareerBuilder.com employs more than 2,000 people and is headquartered in Chicago, IL. In just five short years, CareerBuilder.com went from being one-fifth the revenue size of the market leader, to the nation’s largest online job site. This expansion, along with its international growth, caused them to experience challenges with their current HR system. One of their largest challenges was the fact that their current HRIS did not have “Self-Service” capability, nor did it offer the ability to automate workflow activities. The Workday solution offers a highly flexible and configurable business process core, which allowed CareerBuilder.com to design business processes, including workflow notifications that would meet the challenges they were facing. Together with Workday, Collaborative Solutions assisted CareerBuilder.com with constructing these business processes in an efficient manner, so as to streamline the process for CareerBuilder’s HR team, as well as their worker population who would also be able to take advantage of these processes via Workday’s intuitive Employee Self Service tool. Today, CareerBuilder.com is recognizing major benefits from their business process workflow as well as Workday’s self-service capabilities. With the Workday deployment primed by Collaborative Solutions, they are now “live” both in the United States and abroad. According to Rosemary Haefner, VP of Human Resources at CareerBuilder.com, “Collaborative Solutions is a true partner: agile, efficient, and tied to our success.” Since Workday is global at the core, the self-service experience for global employees is specific to their location and will soon even be in their home language if they choose. Discover how streamlining HR processes with Collaborative Solutions helped CareerBuilder.com meet the challenges of growth and expansion.